Where would you ride a bicycle here? 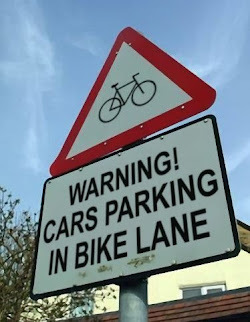 Bike Lane = Parking Lane? Is this the new Bike Lane King? Big new truck gets to park where it wants, right? Or more right for me and less for you. but please not in the bike lane! This is 42nd Street and yes, it is a bike lane. I checked with the City of Florence and they comfirmed that. Now it would be really nice of the City to mark every bike lane in town. Not everybody "knows" that a bike lane is not a place to park cars. On Saturday, April 25th a firetruck was packed on Kingwood Street in the bike lane, right in front of the crematory. Two things are infinite: the universe and human ignorance; and I'm not sure about the universe. "I am doing construction and this is a public street" - fix your light and get bright dude! One day later, same guy. Hard to believe but true. around 3 P.M. - this time on the other side. Ya not too bright, look at his light. We all know, good parking spots are hard to find. Just like men: the good ones are taken, the other are handicapped. Oregon Masonic Family - more rights than others? Does the American flag give you the right to park in a bike lane?